Find the Best Florida Beaches on BeachHunter.net! " So many beaches, how to decide? Had enough Disney? Hit the beach! Florida beaches on a budget. BeachHunter's tips for finding cheap places to stay. Ya 'gotta eat, right? Tips from a cheapskate. The less it costs, the more fun it is! Unconventional travel strategies: are they for you? And you thought everyone was looking for shells. Not! Questions most people ask about Florida beaches. What Can You Do Here on BeachHunter.net? How about downloading my free Beach Survival Guide with tips the locals know on how to be safe at the beach? Or check out my info pages on sharks, jellyfish, stingrays, and red tide. Find out what the Gulf water temperature will be when you visit and what temperatures are comfortable for swimming. Learn the best months for visiting Florida. Want to see my Florida beach photos and read my comments about the beaches and islands I've visited (every beach on the peninsular west coast of Florida)? There's a beach for everyone in Florida. This site mostly deals with the Gulf coast, but you'll find plenty of information on beaches near Orlando's Disney World as well as on beaches in the Florida Keys. Florida beaches are special. Florida Gulf Coast beaches are even more special to me because that's where I've been going to the beach my whole life. I've spent the most time on Anna Maria Island. As a teenager I did a lot of surfing on Anna Maria in the 1970's. Over the last 10 years I've spent lots of time on all the islands and beaches. In fact, I've been to 96 named beaches, and nearly as many unnamed beaches. There is truly something for everyone here on the Gulf Coast of Florida. From busy, entertainment oriented vacation beaches, to sleepy residential beach towns, to exclusive condominium and resort area beaches. Whether you want nature or nurture, you can find it here. The west coast of Florida is growing quickly though, real estate is booming, traffic is on the rise, and land is being rapidly developed. So enjoy this Florida today, because 10 years from now, we'll all be looking back on the "good 'ol days" of 200X, when land was cheap, traffic was manageable, and there were still sleepy little beach towns to discover. Honeymoon Island Caladesi Island near the city of Dunedin. Both Islands are state parks and provide a quiet getaway from the busy Pinellas county cities. Take the ferry from Honeymoon to Caladesi, rent a kayak, walk the nature trails, take your dog to the doggy beach on Honeymoon Island, do some fishing, or look for shells. Honeymoon Island in particular has a nice selection of shells. Clearwater Beach is a major tourist destination for those looking for lots to see and do. Clearwater beach has been completely renovated and the changes are fantastic. The traffic flow is much better and a wide paved promenade along the beach front means you can walk everywhere. Sand Key, a long, narrow barrier island in Pinellas County is a well-developed barrier island with many miles of white beaches. Sand Key Park on the north tip gives way to huge condominiums and private homes of Belleair Shore and Belleair Beach. Sand key park is great for picnics, has plenty of parking and a large white sand beach. It is also a great surf spot, when the waves are up. Indian Rocks Beach is a true beach town with plenty of beach cottages and a few low-rise condominiums, excellent restaurants, and lots of free beach parking and access. Indian Shores (home to the Suncoast Seabird Sanctuary), Redington Shores, and North Redington Beach and Redington Beach are generally upscale beach communities with more than their fair share of tall private condominiums. Many new condominiums are under construction. Real estate is a booming business. Madeira Beach occupies the southern tip of Sand Key, right on John's Pass, famous for being grouper fishing headquarters of the state. Shopping is an attraction on Madeira Beach in addition to restaurants and an outstanding powdery white sand beach. Madeira has beautiful white sand on its beaches. Treasure Island is a heavily developed and very busy island with businesses and condos and plenty of private residences on the bay side. Treasure Island has the widest beaches on the Gulf coast, although the Marco Island beaches are heavy competition for this title after their renourishment. My favorite part of Treasure Island is the community at the southern end of the Island called "Sunset Beach." Sunset Beach has a nice public beach access and pavilion where you can eat your lunch or have a wedding reception. 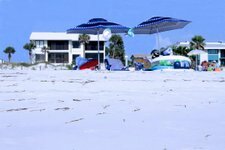 St. Pete Beach and Pass-a-Grille Beach have all the comforts of home within walking distance of most of the hotels and beach rentals. Each has an outstanding stretch of white sand beach, reasonable accommodations and both are top choices for Florida destination weddings. Pass-a-Grille is really a laid-back but up-to-date community. I've taken some great photos of Pass A Grille Beach in St. Pete Beach. For more detailed information on St Pete Beach and its beautiful beaches and parks, you can visit my web site on St Pete Beach. Fort Desoto Park (Dr. Beach's pick for the number 1 beach in the nation in 2005) is a huge county park with no homes or businesses. It is a must for visitors looking for some nature. Egmont Key and Shell Key are two undeveloped islands that can only be reached by boat. Each island makes a GREAT day trip. In this beautiful island park you can rent bikes or kayaks, camp right on the water at a shady campsite, walk or roller-blade on the several miles of sidewalks throughout the park, go fishing on either of two great piers, or just hang out at the beach and relax. The Sunshine Skyway Bridge, spans Tampa Bay and leads to the southern beaches, starting with beautiful Anna Maria Island. Compared to Pinellas County beaches, the southern islands and beaches are much less developed (with a few exceptions). The lesser developed islands generally have little or no nightlife, and fewer "attractions." But they more than make up for it with their beauty and quietude. Longboat Key is very exclusive and upscale with large beachfront resorts and private homes and condominiums and limited beach access. The beaches are beautiful though and there are plenty of rentals available for vacationers. It is a long island with an equally long sidewalk for bikers and hikers. Lido and Siesta Keys are where Sarasota goes to the beach (and much of the rest of the world as well). They have something for everyone and are close to the night life, restaurants, and cultural attractions for which Sarasota is famous. 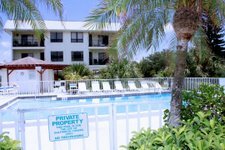 If you are planning a vacation on Siesta Key, be sure to check out my pages on Siesta Key Beachfront Vacation Rentals so you can pick just the right area for your needs and preferences. Life slows to a crawl on the Venice beaches, Manasota Key, and Casey Key. It gets even slower on Palm Island (Little Gasparilla) with boat-only access. Enjoy it while it lasts. Gasparilla (Boca Grande) is famous for its Tarpon fishing, its fishing history, and as a private refuge to the old-money elite. It is a beautiful island and is well worth an extended stay. The beaches are small, but beautiful and quiet. Visit the lighthouse and museum on the southern tip of the island and enjoy the view of Cayo Costa Island across Boca Pass. Cayo Costa Island State Park is probably the largest undeveloped island on the Gulf coast and is the best primitive beach camping available. With lots of native vegetation, wild hogs, and 'gators, this park has some wilderness for you (no cars, roads, or homes). Just south of Cayo Costa lies North Captiva, Captiva, and Sanibel, which are world famous for their island charm and away-from-it-all feeling that they offer to those who can afford it. Pine Island, though it has no beaches and nothing much to do (except fishing, relaxing, and eating mangoes), is one of my favorite islands because it is so undeveloped and is still centered around fishing, farming and small business. There is no MacDonald's on Pine Island. The area around Pine Island is developing rapidly, especially in the Burnt Store Road area, so don't expect this to be quiet forever. Fort Myers Beach picks up the pace with its Key-West atmosphere and throngs of people and traffic jams, but the congestion quickly fades when you get further south to Lover's Key. There are a ton of hotels on Fort Myers Beach, and the beach is beautiful. Lots of coconut palms, calm (but not so clear) water, and long stretches of wide white sandy beaches make this island a major attraction. There is plenty to see and do in the area if you are so inclined. Lover's Key is a State Park made up of several mangrove fringed islands, just south of Estero Island (Ft. Myers Beach). You can always find a quiet beach here, especially during the weekdays. Rent a kayak, do some fishing, or explore the nature trails. There is a food concession and restrooms here. Bonita Beach is a lush island with good beach access between magnificent beachfront estates. Barefoot Beach Preserve provides a mile and a half of undeveloped beach bordering Wiggins Pass. This is a beautiful green area. The beaches have lots of shells and are decidedly upscale. Naples, known for its abundance of the highly visible well-to-do, has not forgotten the importance of a beautiful garden and landscape, and every beach and home is lush with tropical foliage and coconut palms. Despite the abundance of large condominiums, the foliage creates an appealing atmosphere and a quality of light that is most welcome. I like the area around the Naples Pier. There isn't much in the way of inexpensive accommodations on the beach in Naples, mostly expensive beach resorts and private homes and condos. But there is plenty of beach access, and it's worth it. The sunsets in Naples are spectacular. Marco Island, an entirely upscale community sitting on the edge of the Everglades and the Ten-Thousand Islands, is another lush and green island that didn't know when enough was enough when they started building condominiums on the beach. Nevertheless, the Marco beaches are beautiful, and for the visitor who likes a view from above (lots of tall condos) and all the comforts of home, Marco has it all. The Gulf is shallow and calm around Marco, and bird watching opportunities are excellent, especially at Tigertail Beach. I'm sure you'll find plenty of interesting and useful information and beautiful photos on Beachhunter.net. And, I'd love to hear from you. Tell me about your favorite beaches and any interesting discoveries you've made on your vacation, like favorite beach restaurants, or things to see. So please browse BeachHunter.net and enjoy the photos of Florida beaches. If you love Florida so much that you are planning to move here, you can find crime statistics on the internet that will help you pick the right neighborhood to live in as well as information on how to start a business in Florida. If you need documents like birth certificates, death records, marriage records or divorce records you can easily find Florida public records online. It may cost more to order public records online than in person, but it's much more convenient than driving down to the clerk's office and waiting in line. Notice: This entire site, including all text and photos is protected by international copyright laws. Copyright © David McRee www.beachhunter.net . Second Edition Now Available on Amazon! A mask and snorkel are the cornerstone of a happy beach vacation. A good rash guard shirt protects against sunburn. A must for kids! I always place my camera and other sensitive stuff in a Sea to Summit dry sack. The 4 Liter size is my favorite. Sun and wind are a constant on the beach. A good beach tent helps with both and will block strong wind and blowing sand. Polarized sunglasses are the best for the beach. Really cuts the glare off the water so you can keep an eye on the sharks. Just kidding! If you aren't using a tent/cabana, you need an umbrella. They don't like strong winds but they can be anchored. Don't let your phone/tablet die out on the beach. Take this battery charger pack along. If you use a beach umbrella, you must have this ingenious device. I love my Pole-R-Bear Umbrella Hooks! You know your phone will end up either in the water or in the sand. Put it in a waterproof case so you don't have to worry about it. Dehydration is a big concern at the beach. Gatorade works, but is full of artificial stuff. Ultima Replenisher is all natural and has no sugar. It uses Stevia (a plant)to sweeten. I use it. I love it.